A Nevada accident can be scary. Depending on how bad the collision is, the results can be life-altering. Below are some frequently asked questions regarding Nevada accidents. I was hurt in a Nevada accident, do I really need to hire a personal injury lawyer? While there are certainly some cases where you wouldn't need an attorney, you really can't know without actually talking to an attorney. For this reason, it is important to make the determination as to whether or not legal representation is needed sooner rather than later. Because virtually all personal injury lawyers assess free initial consultations, there is no risk to you in contacting one right away. I have medical bills and other costs piling up, how can I even afford a lawyer? Most personal injury cases are taken on a contingency fee basis, which means the attorney you hire will not collect his or her legal fees if and until compensation is successfully obtained. In other words, there is little to no risk to you. What are damages and what type of monetary compensation can I seek in my case? Damages are typically a financial award that is given to the injured party for an injury or another loss, if he or she is able to prove that another party was at-fault for the harm. Under Nevada law, injured parties can typically collect economic damages for losses that are quantifiable, or can be calculated. This generally includes property damage, medical bills, and lost wages, to name a few. In most cases, an injured party can also collect non-economic damages. One common non-economic damage is for pain and suffering. I have been offered a settlement by the insurance company or the other driver. Should I accept even if I think the offer is unfair? The offer that you are given by the other side may seem like it is non-negotiable, even if this is never said. If you are not accustomed to negotiating with others, you may be concerned that rejecting the offer could leave you with nothing at all. This is one of the many reasons why having your own personal injury attorney is so important. He or she can guide you through the process and advise on the reasonableness of the offer. How much time do I have after my accident to file a lawsuit in court? The time limit during which you can file a personal injury lawsuit in court is known as the “statute of limitations.” In Nevada, this time frame is two years from the date of the accident. Filing sooner rather than later, typically within the first six months to one year of the collision, will likely make it easier to preserve evidence that will help prove your case. 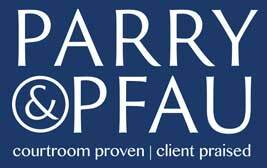 If you have any more questions about your Nevada injury, or know someone who has been hurt in Nevada due to the fault of another, contact the skilled personal injury lawyers at Parry & Pfau. We proudly serve clients across Nevada and will guide you every step of the way. Contact us today for your initial case evaluation. Newer PostIs Prostitution Legal in Las Vegas?